Air Fryer Sizes: How Big of an Air Fryer Do i Need? Buying an air fryer can be a challenge for first-time buyers. With more than 100 models on the market manufactured by dozens of well-known name brands, as well as a number of generic clones in a number of available sizes. The advice and tips listed below are intended to provide some helpful answers to your questions and concerns about selecting the best air fryer for your personal convenience. No matter what your family size is if you batch cook or cook larger sized meals, we recommend the 5 or 6 quart. How are Air Fryers Sized? Which Size Air Fryer Should I Buy if I Have Limited Counter Space? What Size Air Fryers will Cook a Whole Chicken? • Air fryers that range from 3 to 5 quarts are very popular for a range of versatile cooking. • 5.3 to 5.8 quart sized air fryers are well suited for 3 to 5 member families. • 2.2 to 3.0 quart sized air fryers are ideal for 1 to 2 family members. • 6.0 to 16.0 quart sizes have lots of cooking capacity with added functionalities for grilling, baking, and roasting. • 1.0 to 2.0 quart sized air fryers work well for single individuals and for frying snacks. • 3.0 to 5.3 quart sized air fryers have the capacities for cooking meals and snacks for 2 to 5 people. • 5.8 quart sized air fryers can cook a 4 pound whole chicken, have several cooking compartments, and baking cages. • 6.5 to 10.5 quart sized air fryers can roast whole chickens, and have the versatility for grilling, baking, casseroles, and pizzas. • 16.0 quart sized air fryers are excellent for large families and bulk cooking. Air fryer models are designed to handle certain amounts of foods during a cooking cycle and this information is often shown in quarts, liters, or pounds. While the models will inform you about their size capacities, they are guidelines and not absolutes. The type of food that you are preparing will determine what will safely fit into the cooking compartment. A steak, a couple of chicken legs or wings will take up more space than a serving of sliced fries or other vegetables. Phillips, a popular brand for top quality air fryers and they refer to their air fryer sizes in terms of food poundage. Their 2.2 quart model will state that it is an air fryer sized for 1.8 pounds of food, while their 3.2 quart model will state that it is an air fryer sized for 2.6 pounds of food. American air fryers refer to the size of their models in terms of food quarts. The smaller model sizes are in the 2.2 to 3.7 quart range, the larger model sizes are in the 5 to 6 quart range, the extra-large model sizes are in the 8 and 16 quart range. International models refer to their air fryer sizes in terms of liters, such as 2.0 or 4.0 liters, even when the models are designed for usage with American electrical outlets. Logically, the larger the air fryer capacity is, the larger the model will be. If you only have a small counter area where you would like to store an air fryer between usages, consider a standard 2 to 3 quart capacity air fryer which does not require a large amount of counter space. While the 4 quart units are slightly larger, they will still only occupy the same amount of space as a 4 slice toaster. However, if you are looking for a larger unit with more food capacity, you might consider storing your air fryer in a space under the counter or in a cabinet. Just as you would put away your pots and pans in an out of sight storage area, it’s fine to store an air fryer wherever you have the available space. You can measure the area where you would be placing the air fryer so you will know what size model to look for when shopping. There are a number of handy, quick air fryer charts online that compare several popular air fryers, side by side, that range from 2 to 16 quart capacity with their counter space dimensions. One of the most popular foods made in an air fryer is a whole chicken. It does require a bigger air fryer, 5.3 quarts or larger, since even a small whole chicken can be 3 pounds or more and will not easily fit into the standard 2 to 4 quart capacity models without breaking the chicken’s backbone to reduce the needed cooking space. The added beauty of having an air fryer that will roast a whole chicken is that you can also roast one rabbit, two capons or two small ducks or pheasants at the same time. There are a number of popular name brand air fryers suitable for roasting whole chickens and they come with rotisserie forks or rotating spits for complete even temperature cooking. The larger capacity models have accessories such as baking cages and racks for layering the types of foods being prepared. These valuable accessories help with a number of different cooking and baking techniques. In addition to roasting a whole chicken, you can still enjoy oil-free fried meats, fishes, and vegetables. The larger units can bake casseroles, small cakes, lasagna, pizza, quiche, breads, and muffins. Depending on your culinary skills and how often you intend to make meals, snacks, and desserts, the larger air fryers may well be the best selection for your small or large family. A larger air fryer, with its versatile cooking applications, can easily replace a number of other appliances such as a toaster, toaster oven, convection oven, or bread maker that are currently occupying counter space. Not only will you have all these conveniences in one appliance, but you will have freed up valuable counter space for other kitchen accessories such as a coffee mug tree or a butcher block knife holder. Several top named larger models that can easily roast whole chickens are the Phillips HD9240 XL Hot Air Fryer, the GoWise USA Turbo Air Fryer 10.5 quarts, the Power Air Fryer XL 5.3 quarts, and the Big Boss Oil-Less Fryer 16 quarts. 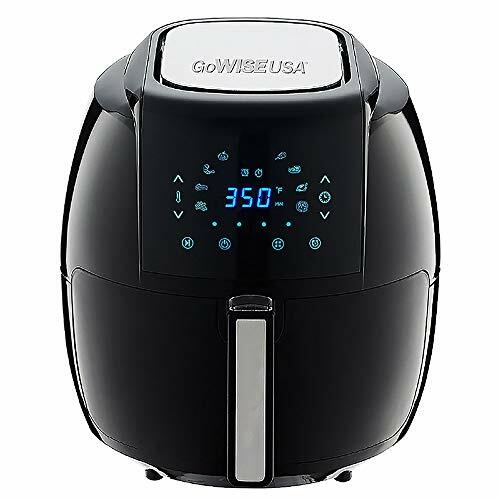 Brand Names of Air Fryer manufacturers that have established themselves with top quality products, at reasonable prices, with good reviews from people who are using these appliances. While Phillips air fryers are the leading models available for home cooking, there are lots of product reviews available online. Size and Food Capacity can range from a small model with 1.8 to 2.5 pounds of capacity up to much larger models with 16 quarts or more of capacity and a number of accessories for various cooking and baking conveniences. Smaller air fryers are intended for smaller amounts of food or snacks while the larger models can cook enough food for larger groups of people. Temperature controls that you manage will allow you to modify the cooking time from a slow process to a faster finish. Wattage requirements can vary from 800 to 1400 watts depending on the model that you select. Be sure that your kitchen outlets will support the wattage that you will need. Most top name brand air fryers offer you a choice of purchasing a model with LCD digital or manual analog controls and displays. The number of available pre-set modes also vary from one air fryer to another. Some models offer you the convenience of pre-setting your frequent timings. Be sure that the model you are interested in buying has the number of temperature settings and wet/dry cooking modes that you want in an air fryer. Air fryers with automatic On/Off controls means that you do not have to be near the food while it is cooking unless your recipe requires that you turn the food over during the cooking process. Check out the number of cooking compartments available with the model size of your choice. Some air fryers will only allow you to cook one food item at a time, while other units have more than one cooking compartment for complete meal preparation all at once. If you want to do more than frying in air fryer, check out the other cooking applications available in the model size that you select. Larger air fryers are also useful for grilling, roasting, and baking. Some models come with the required rakes, rotisserie forks, and baking cages while other models sell these accessories separately. Good maintenance of your air fryer will keep the model working for a long time and remove any food and oils left in the bottom of the unit. See if your air fryer needs to be hand washed or if some parts can be placed in a dish-washer. Product warranty is an important consideration. Never buy an air fryer unless it has a product warranty. Nothing is more frustrating than spending good money for an air fryer that may be faulty and there is no manufacturer warranty. An Owner’s Manual can be very helpful. See if the air fryer comes with an Owner’s Manual, or if you need to go online for operational instructions. Replacement parts can save you the time and money of needing to replace your air fryer is one or more elements wear out. Find out if you can purchase replacement parts for your air fryer, if you need to have an appliance repair person service the unit, or if you need to buy a new unit when a part wears out or malfunctions. Prices for air fryers range from just under $100 to nearly $400, depending on the brand name and size of the fryer you want. Some manufacturers offer specials, provide coupons, or have sales on their models. You can check on their air fryer models by visiting their home websites. Whether you have a small or large kitchen, whether you are single, have a small or large family, whether you entertain a lot, or whether you are the next Julia Child, there is an air fryer that will meet your cooking expectations. With a reasonable amount of research, you will find your ideal air fryer that will fit perfectly into your cooking needs. Cooking with an air fryer means that you and your family will be able to enjoy the taste and flavors of the food without any lingering scent remaining in the kitchen from having just cooked fried foods. No smoky haze in the air or fishy smells, if you’ve just fried fish. A very real, great dining advantage. Once you have experienced the ease of cooking with an air fryer, savored the delectable foods, and have enjoyed the health benefits gained from using only a tiny amount of oil or no oil at all, you’ll wonder how you ever got along without this totally efficient and modern kitchen appliance.